Which neighborhoods in Fargo-Moorhead have the most noise complaints? 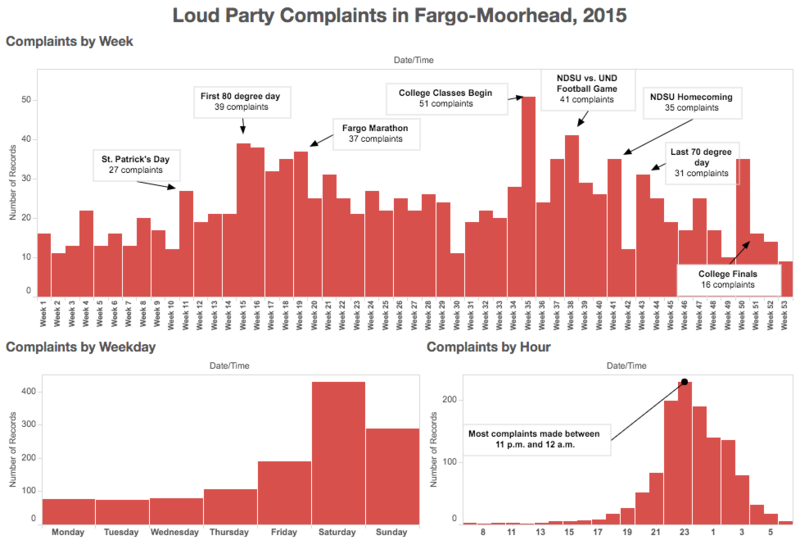 Do the 30,000 college students in Fargo-Moorhead drive those complaints? Below are 1,241 loud party complaint dispatches in 2015 compiled using area police dispatch logs available in near-real time via the Red River Regional Dispatch Center. North Dakota State University's campus creates a lot more loud party complaints than Concordia College or Minnesota State University Moorhead, even when student body size is taken into consideration (8,100 at MSUM and 2,500 at Concordia compared to NDSU's 14,500). Outside of NDSU's campus, there are clearly a few pockets of loud neighborhoods, including University Ave. south of I-94, just south of West Acres mall and near Rendezvous Park in West Fargo. Students are rowdy as classes begin (most complaints the week of August 23-29) and as the weather warms, but get quieter as they pack up and leave for the summer. Week(end)s with a lot of noise complaints seem to be followed by a quieter week(end). Most complaints were dispatched between 11 p.m. and 12 a.m. - likely when the neighbors are sleeping but the party still has energy. Party complaints drop off after 3 a.m.